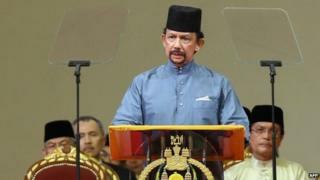 Brunei will introduce a tough Islamic penal code from Thursday, its leader has announced. Sharia punishments that will include the severing of limbs for theft and death by stoning for adulterers will be brought in over three years. In April, the UN voiced "deep concern" about the planned change. Brunei already adheres to a stronger form of Islamic law than neighbouring Malaysia and Indonesia, banning the sale and consumption of alcohol. The tiny state, on the island of Borneo, is ruled by Sultan Hassanal Bolkiah and has grown rich on oil and gas exports. The move - delayed from last week - came from the Sultan. "Today... I place my faith in and am grateful to Allah the almighty to announce that tomorrow, Thursday 1 May 2014, will see the enforcement of Sharia law phase one, to be followed by the other phases," AFP news agency quoted him as saying. The penal code will be introduced over three years, with offences in the first phase covered by fines and prison sentences, the Brunei Times reported. Amputations come under the second phase, and stoning, for crimes including adultery and homosexual acts, under the third phase. When he announced it last year the Sultan, 67, one of the world's wealthiest men, called the code "a part of the great history of our nation". The move sparked a rare strong response on social media. In February the Sultan warned internet users to stop attacking his plans. Officials have said in the past judges would be given discretion in sentencing. It is not clear to what extent the code will apply to non-Muslims. "The law states that the Order shall apply to both Muslims and non-Muslims, except where expressly provided," the Brunei Times wrote. Brunei's civil courts are based on British law, a leftover from the sultanate's days as a British protectorate. Its Sharia courts were previously limited to family matters like marriage and inheritance. The UN in April urged Brunei to delay the changes so they could be reviewed to make sure they complied with international human rights standards. "Under international law, stoning people to death constitutes torture or other cruel, inhuman or degrading treatment or punishment and is thus clearly prohibited," spokesman for the Office of the UN High Commissioner for Human Rights Rupert Colville told a news conference in early April. Mr Colville added that the revised penal code "may encourage further violence and discrimination against women" due to "deeply entrenched" stereotypes.